Immanuel Klein - on form | sculpture: the showcase for contemporary sculpture in stone at Asthall Manor, Oxfordshire. 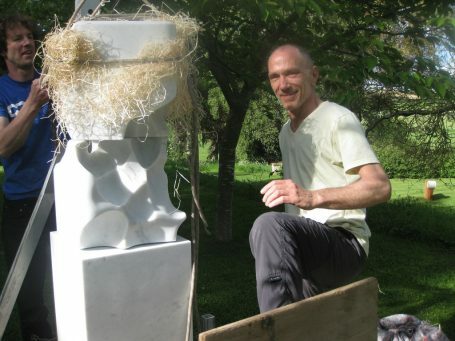 Immanuel Klein was awarded the Brian Mercer Stone Residency 2009 at Studio Sem in Pietrasanta, Italy. During this three month period he learned how to enlarge a model into marble, following the method with the three compasses. Next to that, experiments with sandblasted marble resulted in two reliefs in bardiglio, a light-grey Italian marble. One of them is based on a conformation of fingerprints playing piano on the sand; the first four bars of Debussy’s ‘Claire de lune’. A final sandblast turned it into a velvet-like landscape, showing similarities with the volcanic ash landscape on La Palma. The language of shapes he uses in his recent work is based on sculptural phenomena he finds in nature: sand dunes in Namibia’s north-west, formed by wind, gravity and time, found on a virtual journey in Google Earth; a canyon in the north of Arizona, carved into massive sandstone; salt-lick blocks, eroded by the tongues of sable antelopes; granite rock formations at Brittany’s north coast near Ploumanach; temporary sand structures at sea during low tide.